The Rezortify's Blog > For Teens > 8 Most Unusual And Strange Places in India That You Ought To Visit! If just holidaying at magnificent natural resorts, lavish luxury hotels and sparkling beaches and shivering hill stations are your idea of travelling; these weirdest and unusual places are definitely not for you! What oxygen may be to some, adventure is to rest! An adventurer is another class which does not find beauty in usual places – beauty lies in unusual places! What’s the fun in travelling when the river is flowing down the mountains and all is in place as it should be? Boring, no? Well, for me it is! Who says India does not provide a bunch of such unusual places? Adventure activities in India are not only limited to trekking and rafting (and others! ), the most unusual places of India will chill your spine and erect your Goosebumps. 1. Have A Night Stay In Bhangarh – If You Stay Alive, You Won! Bhangarh in Rajasthan is one of the most unusual and weirdest places in India. Okay, we all have grown up worshipping the truth that ghosts do not exist, and if they do, they are limited just to haunted stories and novels. Challenging to this truth are the large hoardings which you will find in the fort of Bhangarh. Each hoarding shouts at you saying not to stay in the city at night. No, this is not what tribal people there believe! But the Archaeological Survey of India has also prohibited the entry in the fort before sunrise and after sunset. Why not to find out the truth behind? A perfect mysterious place to visit in India! Bhangarh can be reached from Alwar. it is at a distance of approx. 80 km by road from Alwar. Alwar – Sariska Tiger Reserve – Pratapgarh- Bhangarh. 2. Jatinga – Place Where Birds Suicide? Jatinga is a small village in Assam known for its birds’ mystery. The place is famous for the fact that a large number of birds, particularly migratory, commit suicide here. The phenomenon is not just limited to migratory birds, but local birds are also spotted doing the same. The phenomenon is ubiquitous during the monsoon months from September to November. You can take the bus to Silchar. The buses in their route to Silchar have a halt at Jatinga. Further, tourists can also plan day trip to Haflong and then reaching Jatinga by auto rickshaw. 3. Karni Mata Mandir – Count The Rats If You Can! A classic example of a perfect mysterious place in India! Karni Mata Mandir is a famous temple of Bikaner. In addition to the goddess’s shrine, you will also find a large number of rats, particularly uncountable! That one rat tends to create havoc within the house, imagine what fate would be like in this temple. Rats here are auspicious so you can’t hit or kill them. Further, you are a lucky creature if you spot a white rat between. Win over your fear of rat here! How To Reach Karni Mata Mandir? You can reach Bikaner for reaching Karni Mata Mandir. There are lot of local and private buses available to take you there. 4. Magnetic Hill in India– Experience The Magnetism! Ever wished if the bike could move on its own? Pack your bags to Leh and experience the great phenomena! All you need to do is, put your bike in neutral gear over Magnetic hills in India and it will move up the steep mountain road on its own at a steady speed of 10km/hour! The hills here have their own magnetic properties which attract the vehicle to move on its own. Airplanes too experience the same phenomenon and it is thus advised to pilots to not to fly over these hills. How To Reach Magnetic Hill, Leh? Magnetic hill is at a distance of 27 kilometres from Leh and lies on Leh Srinagar highway. 5. Stone That Could Levitate When Touched By 11 Men? This exciting story comes from Shivapur, Maharashtra! If the legends are to be believed, Qamar Ali, who was known for its power, when was on the deathbed, asked people to place a circular stone near his tomb. 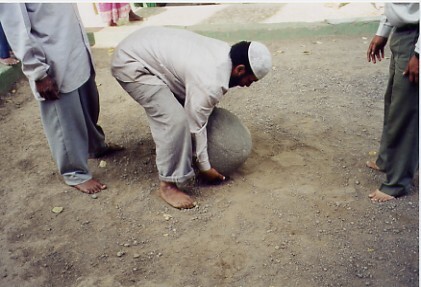 The stone does not get lifted or moved when handled by a single hand, but when exact 11 men chant ‘Qamar Ali Darveeeesh’, stone flies in the air, around 1 foot above the heads! How To Reach Shivapur, Maharashtra? Shivapur is just at a distance of 8 kilometers from district headquarters of Pune in south. ShivajiNagar railway station is the nearest to the Shivapur. 6. Great Banyan Tree – Howrah! What could be mysterious in a banyan tree? Well this one occupies 4 acres. Single tree, 4 acres, 1 km span? Wow! Great banyan tree stands in the Acharya Jagadish Chandra Bose Indian Botanic Garden in Howrah. Road distance between Howrah and Kolkata is 8 kilometres. Place is well linked by roads, rails and flights. Fort of Kumbalgarh shares its place in the world’s heritage site. The fort is built on a hill at an altitude of 1100 meters and has wall extending to 36 kilometers. This wall is said to be the second largest wall only after the Great Wall of China! Kumbhalgarh fort can be easily reached from Udaipur city by taxis and buses. Roopkund trek is situated at an altitude of 5,029 meters in Uttarakhand. The lake is ideal for trekking due to its snow-capped peaks and rock glaciers. What is even more adventurous is the presence of skeletons beneath the lake which are easily visible when snow melts! Roopkund is at a fair distance and involves both driving and trekking in the final reach to destination! Did we miss anything? You got the list of other unusual places in India too? Write to us and we shall upload!